Vladimir Morozov and Evgenia Tarasova. It’s a bad sign in general if your figure-skating routine fails to impress Johnny Weir, doubly so if it happens to be set to Christina Aguilera. Yesterday in Pyeongchang, the Olympic athletes from Russia Evgenia Tarasova and Vladimir Morozov gave a low-scoring performance to Christina Aguilera’s 2007 hit “Candyman.” They were sporting black suits with some truly heinous yellow polka dots, which is fun in theory, but deeply awkward when executed with the vodka-straight-up-on-ice intensity the pair lent to the program (it didn’t help that they failed to execute several key elements). “Nobody loves Christina Aguilera more than I do,” Weir said during his delightfully scathing (as always) commentary. “But this pair is a little square to be giving us ‘Candyman’ realness.” Lipsinki also cheerfully, cuttingly suggested they should have chosen something else. 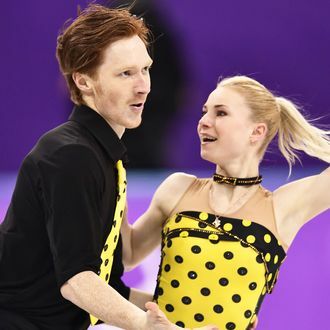 “When you go to the Oscars, you wear Oscar de la Renta,” she said, “not a party dress.” Adding to the intrigue, Morozov and Tarasova’s coach Robin Szolkowy used to skate with Germany’s Aliona Savchenko, who finally won her gold medal in this event after skating a record-breaking program with her new partner Bruno Massot. Did Szolkowy think he could really get the Russians to gold with Christina Aguilera? Was he secretly trying to sabotage them? Are we reading way too much into this? Anyway, the real lesson is: Don’t skate to “Candyman,” unless you candy man can. While you need to go through NBC to watch Morozov and Tarasova’s Olympics performance online, you can see them perform the same routine in 2017 below.